On the eve of the NFL’s biggest and brightest day the NBA is giving their fans a regular season match-up that could potentially be the game of the year. We have last season’s NBA Champion Golden State Warriors vs. the Oklahoma City Thunder and a match-up at the point guard position that will have even the casual NBA fan glued to their television sets tonight. 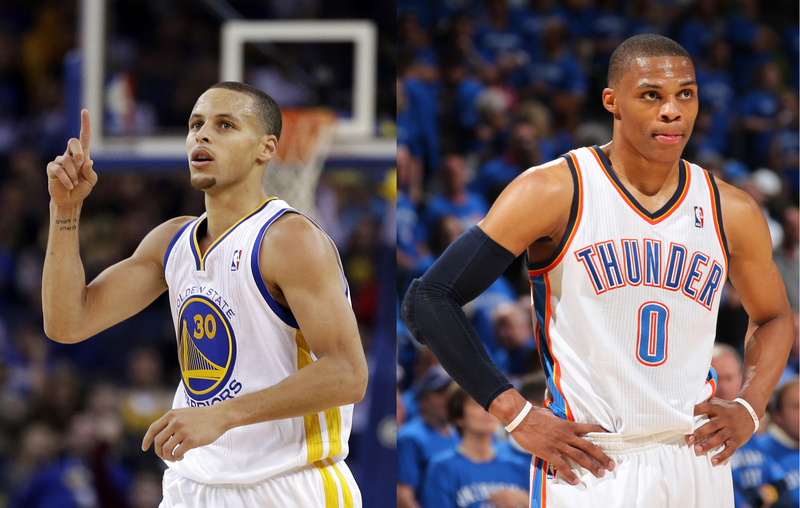 Stephen Curry (GSW) versus Russell Westbrook (OKC). This is the first time that the teams have met this season. The Warriors have already beaten two of the other top competitors for the title (San Antonio Spurs and Cleveland Cavaliers) and they beat them handily. This match-up will be another test for the team and it will also answer a lot of questions for both teams. OKC has been in a great rhythm, they have won 9 of their last 10 games and their dynamic duo have really picked up their play during this stretch. GSW with a win can now have victories against both legitimate contenders in the western conference. One half of the OKC duo, Russell Westbrook, has now recorded 3 consecutive triple doubles and looks to continue tonight versus the Warriors. He will have to put pressure on Curry tonight both offensively and defensively. Westbrook being one of the most aggressive athletes in the NBA can wreck havoc on opposing teams’ defenses. The Warriors will need to play team defense to attempt to slow him down. He comes in with impressive numbers, 24ppg, 10 assists, 7 rebounds and 2 steals per night. Westbrook should look to go at Curry, however he should try not to get caught up in a personal battle between he and the MVP, this may not be beneficial for his team. He needs to play to his strength, which is attacking the basket and putting constant pressure on the defense, he will also need to stay away from behind the arc as he is only shooting 21% from the 3. Westbrook can arguably be the best point guard in the NBA because of the many different ways he can fill up a stat sheet at his position. Tonight could be a barometer for Westbrook (not that he needs one), Curry has been the talk of the town this season and as crazy as it may sound Westbrook seems to be overlooked. For the Warriors it begins and ends with Curry. The team feeds off his energy and his shooting prowess seems to ignite his teammates. He takes the shots that coaches tell players not to take and he makes them look easy. His pregame ritual is a show in itself. He shoots better than his video game alter ego and had 51 points in his last game against the Wizards and one of the better defensive guards in John Wall (who happened to have 44 points himself). Curry and the Warriors are the hot ticket in whatever city they visit however they are unbeaten at home and look to keep it that way tonight. For Curry to be successful against Westbrook he will need to do what he has done all season. He has to shoot with confidence, run the offense and make sure the ball his moving. It remains to be seen if he will have one of those monster games however I’m sure Curry is looking forward to his match-up against Westbrook. He stirred the pot a little when asked about this weekend’s games, his game and the Super Bowl; he predicted a win and a win, a win for the Warriors and a win for the Carolina Panthers. Curry also comes into tonight with some very impressive numbers, 29ppg, 5rbs and 6 assists; this will be a very exciting game. The match-up between the two point guards will be the headliner tonight however the other big names will surely be just as impressive, Draymond Green and Klay Thompson will look to provide support for the Warriors. Its not often an article about the Thunder fails to mention Kevin Durant’s name but I can guarantee that he will have a major imprint in this game. Let’s applaud the NBA schedulers for this gem of a game tonight on NBA Super Saturday. I won’t predict a winner tonight between the two teams but I do believe the fans won with this game being on the eve of the Super Bowl. NBA fans get ready for a good one.